Ready for a touch of spring? You can start the season off with a planter that is ready to harvest basil leaves. There is a two variety planter with Genovese basil and Purple basil or you can select a three variety planter with a choice of Genovese, Purple, Lemon, Lime or Cinnamon basil combinations. They will be planted in a decorative pot. Please select which varieties below. All plants are certified organic. Genovese Basil is the traditional green basil often used in making pesto. The leaves are dark green and the plant has small white flowers. Purple Basil is a beautiful purple plant with small purple flowers. Excellent for making vinegars or as a garnish for your favorite meal. Flavor is strong and it tastes very similar to Genovese basil. Cinnamon Basil has a sweet cinnamon aroma. Distinctive violet stems and veining of green leaves with lavendar blooms. Looks beautiful in bouquets. Often used in Vietnamese or Thai cooking. 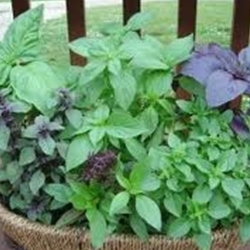 Lemon Basil is a sweet, tangy basil with bright green leaves. Try it in poultry, seafood or pasta dishes. Lime Basil has a zesty lime aroma. It adds a unique citrus flair to fish and salads. Bright green leaves look similar to lemon basil.